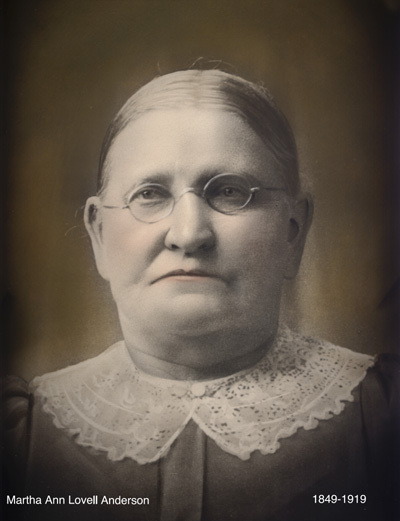 Martha Ann Lovell was born 24 March 1849 in Big Bend, Pottowatamie, Iowa. She died 27 July 1919 in Oak City, Millard, Utah. 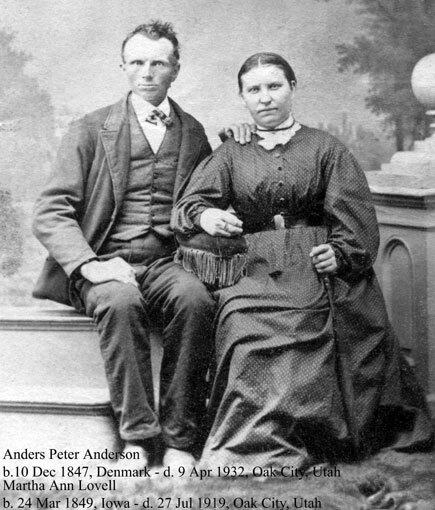 Martha married Anders Peter Anderson 14 April 1873 in Salt Lake City, Salt Lake, Utah. Anders was born 10 December 1847 in Taarnborg, Soro, Denmark. He died 9 April 1932 in Oak City, Millard, Utah. In the picture above are, back row, Left to Right: Sarah Delila Anderson (1886-1973), John Lee Anderson (1876-1961), Agnes Eleanor (1883-1945), George Hyrum Anderson (1889-1978). 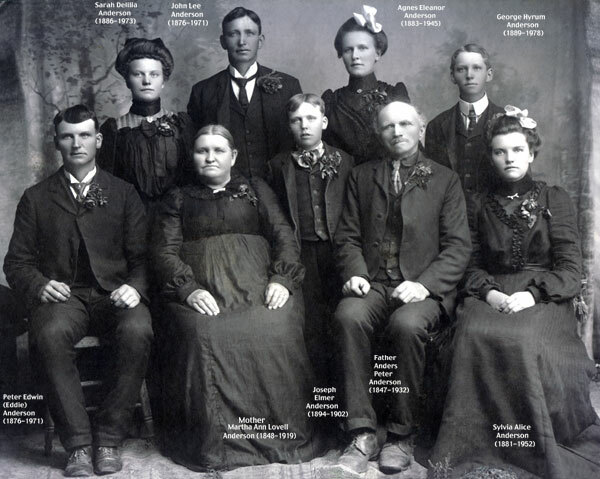 Front Row, L-R: Peter Edwin (Eddie) Anderson (1874-1961), Martha Ann Lovell Anderson (1849-1919), Joseph Elmer Anderson (1894-1902), Anders Peter Anderson (1847-1932), Sylvia Alice Anderson (1881-1952). Below is a link to a page with a picture of Martha Ann Lovell Anderson's daughter Agnes Eleanor and her husband Edward Lyman.